This research and action-oriented project, funded by the Geneva International Academic Network (GIAN), is centred around the current international debate on migration and development. The research team's objective is to provide a better understanding of the potential of highly skilled migrants as agents of development, by focusing on their participation in the production and circulation of knowledge. Considering knowledge as a core catalyst in the struggle against poverty, this project examines the potential of highly skilled migrants from developing countries living in Switzerland to favour development in their countries of origin through the practice of brain gain mechanisms that have been shown to offer promising possibilities for effective North-South and South-South cooperation. By creating sustainable strategic synergies among academic institutions, international organisations, the private sector and NGOs, this project intends to establish a Swiss Network of Scientific Diasporas for the circulation of knowledge. It is expected that the Network will serve as an innovative mechanism providing long-term structured support to highly skilled migrants within diaspora communities, linking them to their countries of origin in a systematic and institutional manner. Data collection on diasporas, often with a focus on gender dimensions is one of the main objectives of migration and development studies. 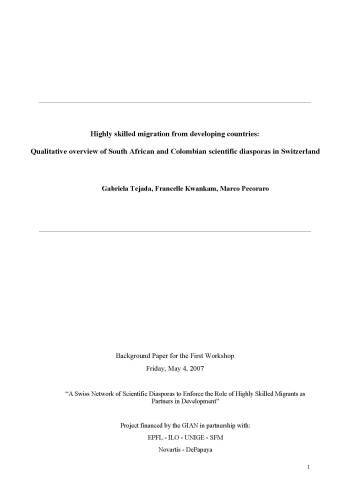 Accordingly, the increasing volume of highly skilled migrants from developing countries present in Switzerland has offered significant research opportunities for an examination of the professional activities of these migrants and a monitoring of the contributions they make to their countries of origin. However, the role of highly skilled migrants in the production and diffusion of knowledge that benefits their countries of origin has remained relatively unexplored or unappreciated until now. Nor has the participation of migrant women in furthering development been fully understood. Prof. Jean-Claude Bolay , Coordinator, Cooperation@epfl , International affairs (IA) , Swiss Federal Institute of Technology in Lausanne (EPFL) . Mr Guillermo Arbelaez , Principal Member, DePapaya.org . Prof. Marie-Claire Caloz-Tschopp , Principal Member, Faculty of Psychology and Education Sciences (FPSE) , University of Geneva (Unige) . Mr Ibrahim A. Dia , Principal Member, Faculty of Economic and Social Sciences (SES) , University of Geneva (Unige) . Dr. Rosita Fibbi , Principal Member, School of Translation and Interpreting (ETI) , University of Geneva (Unige) . Ms Francelle Kwankam , Principal Member, International Labour Migration (MIGRANT) , Social Protection Sector (PROTECTION) , International Labour Organisation (ILO) . Mr Marco Pecoraro , Principal Member, Swiss Forum for Migration and Population Studies (SFM) . Dr. Carlos Andrés Peña , Principal Member, Novartis Institutes for Biomedical Research (NIBR) , Novartis Pharma AG . Dr. Gabriela Tejada , Principal Member, cooperation@epfl , International affairs (IA) , Swiss Federal Institute of Technology in Lausanne (EPFL) . Prof. Philippe Wanner , Principal Member, Laboratory of Demography and Family Studies (LaboDemo) , Faculty of Economic and Social Sciences (SES) , University of Geneva (Unige) . Dr. Piyasiri Wickramasekara , Principal Member, International Labour Migration (MIGRANT) , Social Protection Sector (PROTECTION) , International Labour Organisation (ILO) . Dr. Claudio Bolzman , Associated Member, Department of Sociology , Faculty of Economic and Social Sciences (SES) , University of Geneva (Unige) . Prof. Christiane Perregaux , Associated Member, Faculty of Psychology and Education Sciences (FPSE) , University of Geneva (Unige) .